Professor Magda Romanska provides a penetrating and in-depth look at various modern representations of the disabled. 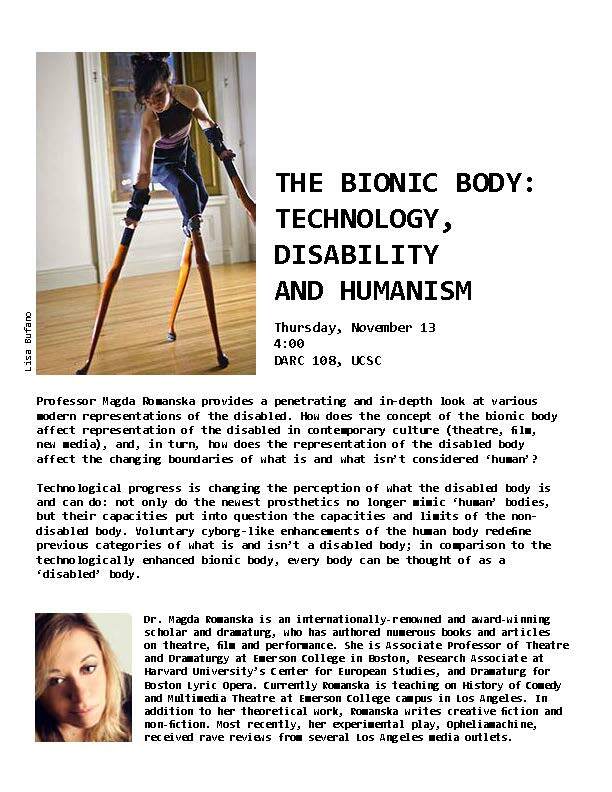 How does the concept of the bionic body affect representation of the disabled in contemporary culture (theatre, film, new media), and, in turn, how does the representation of the disabled body affect the changing boundaries of what is and what isn’t considered ‘human’? Technological progress is changing the perception of what the disabled body is and can do: not only do the newest prosthetics no longer mimic ‘human’ bodies, but their capacities put into question the capacities and limits of the nondisabled body. Voluntary cyborg-like enhancements of the human body redefine previous categories of what is and isn’t a disabled body; in comparison to the technologically enhanced bionic body, every body can be thought of as a ‘disabled’ body. Dr. Magda Romanska is an internationally-renowned and award-winning scholar and dramaturg, who has authored numerous books and articles on theatre, film and performance. She is Associate Professor of Theatre and Dramaturgy at Emerson College in Boston, Research Associate at Harvard University’s Center for European Studies, and Dramaturg for Boston Lyric Opera. Currently Romanska is teaching on History of Comedy and Multimedia Theatre at Emerson College campus in Los Angeles. In addition to her theoretical work, Romanska writes creative fiction and non-fiction. Most recently, her experimental play, Opheliamachine, received rave reviews from several Los Angeles media outlets.